Prior to the storage project discussed here, this set of 20th-century Chinese Domino playing cards had undergone treatment to separate them. The cards had been blocked due to a coating consisting of shellac with protein and oil components that caused the card surfaces to be permanently sticky. The individual cards were stuck together as a result of a shellac coating with a protein and oil components, which acts as a permanent adhesive. The treatment to separate them involved developing a cold temperature application method to cool the varnish below its glass transition temperature, which made the coating temporarily brittle and the cards separable. In order to prevent future re-sticking of the cards, an archival box was custom-designed. 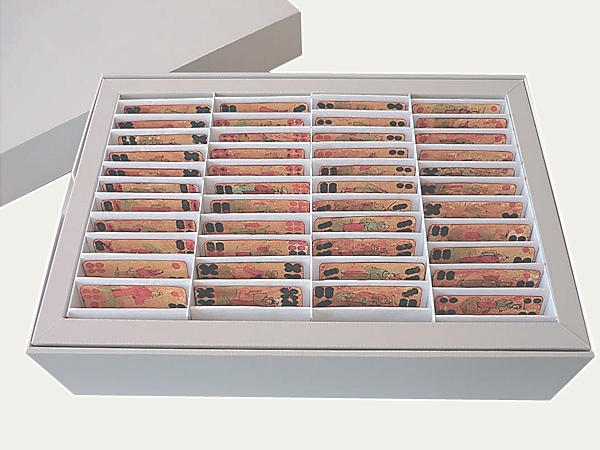 The storage box, manufactured by Klug-Conservation, is made of archival-quality corrugated board and consists of the base of the box, a lid and three inserted trays that are accessible by lowering the flap. Each tray is furnished with concertina-folded supports, which are made from strips of archival board and silicone release paper. The release paper is sewn onto the board material with book binding thread and adhered to the tray at the ends. Silicone release paper (silicone-coated paper with a surface pH of 6.0) was chosen as the contacting support material because it proved to have the best separating properties, which is the most important factor when storing the sticky cards. The slightly acidic pH value is unlikely to have any adverse effect on the cards, which are coated with varnish. 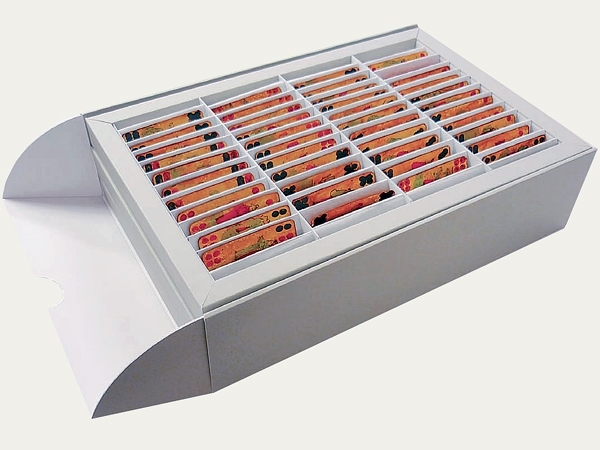 Each card rests in a separate compartment of this box and can be viewed without being touched or removed. The concertina-supports are fixed on the tablets only at their opposite ends, so that each individual compartment can be widened. This makes it easier to access the cards. Literature: E. Carrlee: Does Low-Temperature Pest Management Cause Damage? Journal of the American Institute of Conservation 42, 2 (2003): 144–161. D. Müller: Prüfung von Zwischenlagematerialien zur Lagerung des Nachlasses von Ernst Jünger am Deutschen Literaturarchiv Marbach, 2015, unpublished term paper, paper conservation course, Stuttgart.